Rice swept all 3 teams on the women’s side while Grand Canyon topped Cal Baptist on the men’s side at a quad meet hosted by Grand Canyon on Saturday, January 6th. This is the first season Grand Canyon is hosting meets at the FR Edward J. Reese Aquatic Center in Phoenix, which is also home to the Brophy Catholic College Prep swim teams. In Grand Canyon’s 2nd meet at this pool, 11 pool records fell, 8 women’s and 3 men’s. Grand Canyon swept the men’s and women’s relays, taking down the women’s 400 free relay pool record in the process. Their time of 3:28.29 was only half a second off their time from the Northwestern TYR Invite in November. Grand Canyon’s Diana Jaruseviciute and Mark Nikolaev were the only 4-event winners of the day. Jaruseviciute took 1st in the 50 and 100 free, as well as the 200 medley and 400 free relays. 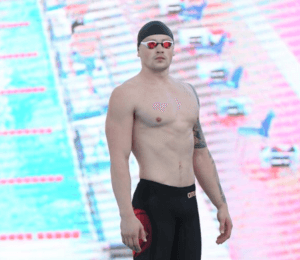 Nikolaev took the 100 back, 200 back, 200 IM, and 200 medley relay, but didn’t take down any pool records, however he already holds the pool records in those events. Rice’s Kaitlyn Swinney was the only individual to break more than 1 pool record, taking down the 200 back and 200 IM records with her times of 2:01.44 and 2:04.41 respectively. One of the fastest performances of the day came from Cal Baptist Sophomore Eric (Scott) Tolman, who crushed the field in the men’s 200 breast and went a 2:00.33. Senior Kaitlyn Swinney claimed a pair of individual events, including the win in a clutch 1-2 finish in the 200-individual medley late in the competition, to help the Owl swimmers sweep three head-to-head duals at the Grand Canyon University Quad Meet Saturday afternoon in Phoenix, Ariz.
Rice won each of the three dual meets, defeating New Mexico State 207-87, Cal Baptist 189-91 and event host Grand Canyon 154-126. After Swinney won the 200-yard backstroke with a time of 2:01.44, she led a 1-2 finish with fellow senior Jaecey Parham in the 200-IM with times of 2:04.41 and 2:06.88, respectively. Five Owls posted event wins on the day, including Alicia Caldwell in the 100-freestyle (51.05), Marie-Claire Schillinger in the 100-breaststroke (1:05.04), Claire Therien in the 1000-free (10:20.40) and another 1-2 finish with freshmen Ellery Parish (1:52.74) and Lindsay Mathys (1:54.07) in the 200-free. Rice head coach Seth Huston hinted that with multiple heats of the 14 swim events, plus alternating the meet a simultaneous men’s meet, Saturday ended up feeling more like a marathon. The Owls’ fortitude to win six of the events, however, was one of the keys to success. 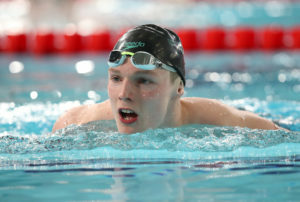 “It was a long session, a three-hour meet today, and the team is definitely tired,” Huston said. “We gave up a lot of points because we were second to Grand Canyon in both relays, and we had to overcome some diving points (in which Rice does not compete), but individually we swam very well. We had really good swims and improved quite a bit compared to yesterday (where the Owls competed in a similar quad meet in Tucson against No. 12 ranked Arizona). 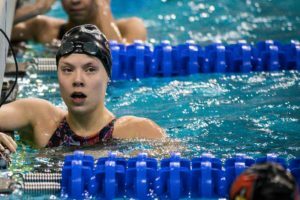 “Kaitlyn’s 200-IM, and the 1-2 finish by her and Jaecey at the end was big for us,” Huston explained. 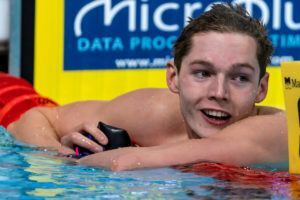 “I was very happy with Ellery and Lindsay in the 200-free. Alicia had another really nice 100-free today. 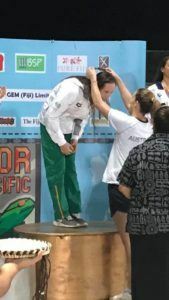 I was really happy again with Kelsey Evans swimming a couple of events for us and doing a great job. I think one of the highlight swims today was Claire’s 1000, which was awesome. She was in the second (traditionally slower) heat and ended-up winning the event with a great effort. PHOENIX – The GCU men’s and women’s swimming and diving program found themselves on various mid-season college swimming and diving rankings this past week. The men’s team, according to the CollegeSwimming.com Division I poll are ranked No. 37 overall and No. 8 for all Mid-Major programs. GCU’s highest previous ranking was No. 47 in 2015-16 and No. 50 in 2016-17 for all Division I programs. For Mid-Major rankings, the Lopes previously were No. 15 in 2016-17 and No. 12 in 2015-16. The Lopes also were listed as No. 17 on the SwimSwam NCAA Mid-Season Scoring. Mark Nikolaev, currently leads the NCAA in the 100 yard backstroke with a time of 44.99, which was an automatic qualifier for the NCAA Championships. Youssef El Kamash finds himself at No. 8 in the 100 yard breaststroke with a time of 52.76. The women’s team comes in at No. 45 on CollegeSwimming.com in the Mid-Major Rankings, beating their previous best ranking of No. 47 in 2016-17. CollegeSwimming.com rankings are based on dual-meet head to head competition, meaning, the teams with the stronger depth, get ranked higher. However, these rankings are not intended to reflect NCAA Championship team placing. The SwimSwam NCAA Scoring Rankings are based on top performers as they would be scored at the NCAA Championships this upcoming Spring, which are based on mid-season times. The Lopes next home meet will come on Jan. 6 versus Cal Baptist at the Fr Edward J. Reese Aquatic Center. PHOENIX, Ariz. –New Mexico State’s Raina Brommer and Sheridan Decker shined bright in the diving categories on Saturday afternoon as the Aggies wrapped up their weekend on the road at Grand Canyon. The meet saw the team prevail over Cal Baptist (170-128), but fall short to Rice (207-87) and GCU (180-118). NM State’s Raina Brommer (276.95) and Sheridan Decker (234.75) placed first and second, respectively in the one-meter diving event. Grand Canyon’s Mennattalah Elmidany finished third with a final score of 234.50. In the 1000-yard freestyle, Claire Therien finished first for Rice with a time of 10:20.40, followed by Cal Baptist’s Buse Topcu who posted a time of 10:20.81. Hanna Huston gave Rice a third-place finish with a time of 10:24.09. NM State’s Katherine Harston placed sixth with a time of 10:45.83. Rice’s Ellery Parish (1:52.74) and Lindsay Mathys (1:54.07) captured the top-two positions in the 200-yard freestyle. Cal Baptist’s Christie Halverson finished third with a time of 1:54.83. Picabo Bender out of the Aggie camp finished sixth with a time of 1:55.34. Iryna Glavnyk gave Grand Canyon a first-place finish in the 100-yard backstroke when she posted a time of 57.14. Caldwell placed second with a time of 57.31, followed by Emily Longfellow from Cal Baptist with a time of 57.63. Eliana Beaudry gave the Aggies a sixth-place finish when she recorded a time of 59.52. Marie-Claire Schillinger completed the 100-yard breaststroke for Rice in first-place with a time of 1:05.04. Alyssa Christianson (1:05.66) and Marina McInelly (1:05.79) placed second and third, respectively, for GCU. For NM State, Hanna McGowan finished fifth with a time of 1:06.15. In the 200-yard butterfly category, Sofia Petrenko of Cal Baptist clinched first-place with a time of 2:05.38, while Grand Canyon’s Estela Davis Ortiz came in second with a time of 2:05.86. Kaitlin Benjamin from Rice placed third with a time of 2:06.76. Harston recorded a time of 2:10.17, which earned her a sixth-place finish for the Aggies. GCU’s Jaruseviciute finished the 50-yard freestyle in first-place with a time of 23.56. Lauren Rhodes (23.93) and Jaecey Parham (24.55) finished second and third, respectively, for Rice. Makena Sutherlandgave New Mexico State a fifth-place finish when she posted a time of 25.18. Caldwell brought home first-place for Rice in the 100-yard freestyle category with a time 51.05. GCU’s Samiha Mohsen finished second with a time of 52.32, while Rice’s Rhodes finished third with a time of 52.58. P. Bender gave the Aggie camp a sixth-place finish with a time of 54.53. Kaitlyn Swinney from Rice placed first in the 200-yard backstroke with a time of 2:01.44. GCU’s Ortiz followed up in second with a time 2:03.35, while Parish placed third for Rice with a time of 2:03.42. Beaudry placed sixth for NM State when she recorded a time of 2:08.64. In the 200-yard breaststroke class, Grand Canyon’s Christianson finished in first-place with a time of 2:18.51 while Nicole Limberg out of the Rice camp placed second with a time of 2:19.29. New Mexico State’s Lauren Wood came in third-place with a posted time of 2:20.71. Cal Baptist’s Buse Topcu placed first in the 500-yard freestyle with a time of 4:55.91, while Rice’s Huston (5:05.57) and Kelsey Evans (5:06.13) placed second and third, respectively. P. Bender came in fifth place for the Aggies with a time of 5:09.86. Jaruseviciute of Grand Canyon nabbed the top spot in the 100-yard butterfly with a time of 57.35. Petrenko of Cal Baptist finished second with a time of 57.60, followed by Rice’s Parham in third with a time of 58.09. Reagan Nentwich posted a time of 58.69, which gave the Aggies a sixth-place finish. New Mexico State’s Brommer captured first-place in the three-meter diving category when she tallied a score of 291.90, while teammate Decker placed second with a final score of 238.70. GCU’s Elmidany finished in third-place with a score of 209.20. In the 200-yard IM, Rice’s Swinney (2:04.41) and Parham (2:06.88) placed first and second, respectively. Christianson (2:07.47) of GCU followed up in third-place. Wood of NM State recorded a time of 2:11.03, which was good for sixth-place. In the final event of the day, Grand Canyon’s team of Jaruseviciute, Ortiz, Mohsen and Roaia Mashaly finished first in the 400-yard freestyle relay with a time of 3:28.29, followed by Rice’s Parham, Rhodes, Caldwell and Lindsay Mathys with a time of 3:28.78. New Mexico State’s P. Bender, Laporte, Sina Wegeland Johanna Pettersson placed fifth in the event with a time of 3:38.32. The Aggies return to the NM State Swimming and Diving Complex as they welcome CSU-Pueblo on Jan. 13. Competition will begin at 11:30 a.m. (MT). 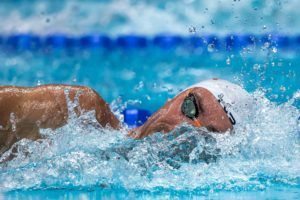 PHOENIX – An early look at NCAA Division I competition worked out well for California Baptist University in a quad dual at Grand Canyon that featured the Lopes, New Mexico State and Rice on Saturday. CBU battled tough but ultimately fell to all three teams: New Mexico State (170-128), Grand Canyon (178-110) and Rice (189-91), with the Lopes and Aggies being future Western Athletic Conference opponents next season. Two of the Lancers newest additions won individual events, while there were several other impressive performances for CBU. Sofia Petrenko and Buse Topcu each won an event, with Petrenko victorious in the 200-yard butterfly in two minutes, 5.38 seconds and Topcu setting a Reese Aquatic Center record when she won the 500 freestyle in 4:55.91. 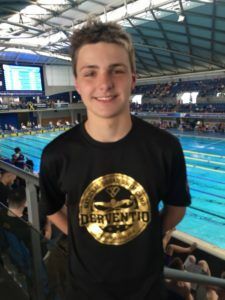 Topcu’s 500 free times was more than two seconds faster than the previous record (4:57.86). The freshman would have set a pool record in the 1000 free, as well, if not for Rice’s Claire Therien winning it in record time (10:20.40) just in front of Topcu (10:20.81). Like Topcu, Petrenko logged two top-two finishes when she went runner-up in the 100 fly (57.60). Emily Longfellow completed a trio of top-five performances, taking third in the 100 backstroke (57.63) and fifth in the 100 fly (58.26) and 200 back (2:08.39). Christie Halverson was the sixth Lancer to complete a top-three swim when she took third in the 200 free (1:54.83), while also taking eighth in the 200 back (2:09.58). The Lancers took fourth in the 200-medley and 400-free relays, as well. Andrea Laliena, Robin Smallwood, Petrenko and Halverson swam the 200 medley in 1:49.14 and Petrenko, Smallwood, Topcu and Mackenzie Mergel, who took sixth in the 500 free (5:09.88), clocked in at 3:36.68 in the 400 free. Savannah Uhlir ended her weekend with two top-five finishes on the boards, taking fourth at 3-meter and fifth on 1-meter with 201.50 and 197.05 points, respectively. “We were short on the women’s side with some injuries, but Savannah stepped up to the challenge and dove really well beating out upcoming WAC opponents,” Dive Coach Jeff Coutosaid.